This Skoda Kodiaq breaks new ground for its brand and offers a well-priced, high quality alternative for buyers in search of a stylish mid-sized SUV with seven-seat versatility. 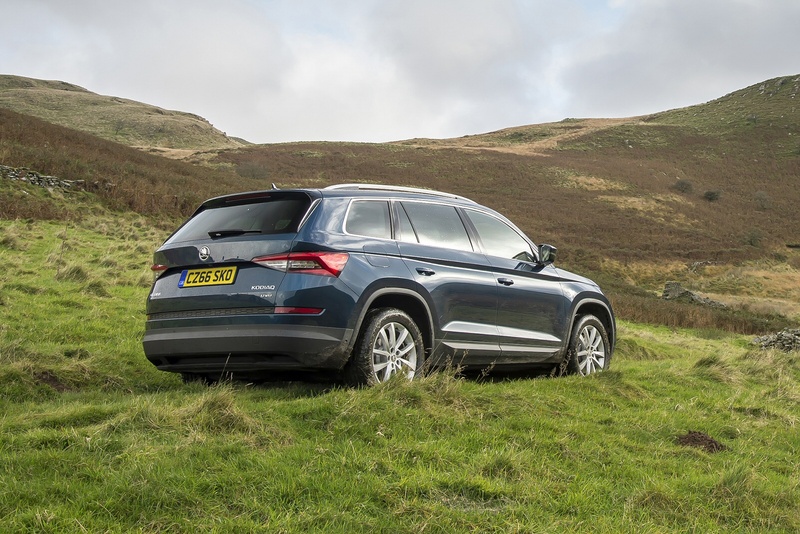 Thoughtful design, a spacious cabin, efficient running costs and a range of distinctly Skoda 'Simply Clever' features are all among this model's attractions. So, will it win over buyers? Let's put this car to the test in top 2.0 TDI 190PS guise. Ever since Skoda introduced its compact Yeti Crossover model back in 2009, many have wondered what a full-sized SUV from the Czech brand might be like. 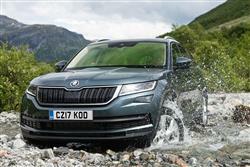 Well this is it, the Kodiaq, a contender that in true Skoda style, aims to offer more for less. Need convincing? What if we told you it's styled by the guy who did the Bugatti Veyron, it's tough enough to take on proper off road trails, it can be specified to drive itself in traffic and it's the lightest and therefore the most efficient car in its class. In short, you get the idea: Skoda certainly hasn't gone at this half-heartedly. But how strong a product have they actually created? Time to find out at the wheel of this 2.0 TDI 190PS variant. Even in the modern era, big spacious seven-seat SUVs have a reputation for handling with all the dynamic finesse of a Channel ferry. As do big Skodas. It's pleasantly surprising then, to find that the Kodiaq is actually quite an agile thing by class standards, its relatively light weight and rigid chassis delivering decent body control through the turns, though you'd better appreciate that if the steering felt more responsive. Another noticeable trait lies in the way that the freshly developed four-link rear suspension set-up provides a firm-ish quality of ride that's a world away from the soft floaty springing you'd get in the Czech brand's similarly priced Superb Estate. Plus you can improve it with an optional 'DCC' 'Dynamic Chassis Control' adaptive damping package. This works through the settings of the 'Drive Mode Select' system, a package able to alter steering feel, throttle response and gearshift timings. 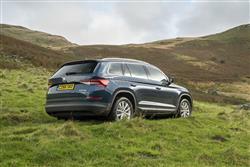 The 4WD set-up, standard on the 2.0 TDI 190PS variant we're trying here, is the usual Volkswagen Group on-demand set-up that cuts in when lack of traction demands it. It's a system that comes with a selectable 'Off Road' mode that focuses all the car's electronic systems for 'off piste' use. That includes the operation of the newly-developed 7-speed DSG auto gearbox that you also have to have on the 190PS diesel model. The performance of this top variant should satisfy most, 62mph from rest occupying 9.1s en route to 129mph. It turns out that Skoda's sharp, clean-cut design language translates very well into the kind of purposeful premium look required of a modern full-sized SUV. The Kodiaq's just 40mm longer than the Czech brand's Octavia family hatch, yet looks far larger, with striking styling supposed to convey an impression of protection and strength. Behind the wheel, the Kodiaq design team have delivered the classiest Skoda cabin yet made. Getting comfortable is easy and in the instrument binnacle large dials flank a useful central trip computer display. Much of the information this delivers can be more graphically provided by this classy centre-dash infotainment screen, provided in 8-inch form here but offered in 6.5-inch guise with lesser trim levels. Either way, an included Smartlink' system allows you to access the 'Apple CarPlay' or 'Android Auto'/'MirrorLink' systems and if you've a set-up fitted out with the Navigation/wi-fi package, you'll be able to make full use of the clever connectivity functions provided by the Czech brand's freshly developed 'Skoda Connect'app. This second row bench features all the versatility you'd want from this kind of seven-seat SUV, so the backrest reclines for greater comfort on long journeys and the base slides back and forth by up to 180mm. In the third row, you're quickly reminded that this is an SUV, not an MPV, the seats being really only suitable for children. When you're not using them, there's a decently-sized 630-litre boot, extendable to 2,005-litres with 2nd and 3rd rows folded. Kodiaq pricing starts at around £22,000, but you'll need a £25,000 to £30,000 budget for the 2.0 TDI 150PS diesel engines that most buyers will want. The 2.0 TDI 190PS model we tried comes only in top-spec 'SE L' or 'Edition' trim and is priced between £3,000 and £35,500. 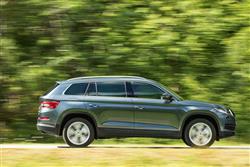 With this engine, you have to have a 7-seat format, DSG auto transmission and 4-wheel drive. Even if you stick with 'SE L' spec, you'll get plenty of kit. That means 19-inch wheels, power-folding mirrors, Skoda's 'KESSY' keyless entry system, a powered tailgate and LED technology for the headlamps and tail lamps, with LEDs additionally used in front foglamps that turn with the bends. Inside, 'SE L' variants are marked out by Alcantara-trimmed upholstery, heated front seats and a 'Drive Mode Select' system that allows you to alter throttle response, steering feel and, on DSG auto models, gearshift timings to suit the way you want to drive. Plus at this level, you get a larger 8-inch 'Columbus' centre-dash touchscreen that incorporates navigation and in-car wi-fi. There's also a 'Skoda Connect' media connectivity app that allows you to access a whole range of web-based services that provide information on things like traffic congestion, fuel prices and parking availability, along with weather forecasts, online news, 'Points of Interest' services and access to Google Earth and Google Street View images. If you've decided on the 2.0 TDI engine, there's no real efficiency downside in choosing it in its most potent 190PS form - that's the Kodiaq we tried. Which means that the readings you get from this DSG automatic flagship variant - 49.6mpg on the combined cycle and 151g/km of CO2 - look decidedly impressive against those of comparable direct rivals like Kia's Sorento and Hyundai's Santa Fe. Fit those two Korean alternatives with an auto gearbox and you'll go around five fewer miles on every gallon and chug out around 25g/km more of CO2. We should also mention residual values, which is an area where Skoda usually performs surprisingly well. The Kodiaq is not going to upset that form, with industry experts predicting that volume 2.0 TDI diesel models should hold on to at least 50% of their original asking prices after the usual three year ownership period. Finally, while it's certainly true that other rivals better the three year 60,000 mile warranty that Skoda provides, you can extend your cover to four or five years by paying extra. Not that you really need to. The brand regularly tops independent consumer satisfaction surveys: according to real people, there are few more satisfying cars to own. If you�re looking for a new SKODA Kodiaq 2.0 TDI Sport Line 4x4 5dr DSG [7 Seat] Diesel Estate for sale, you�ve come to the right place. 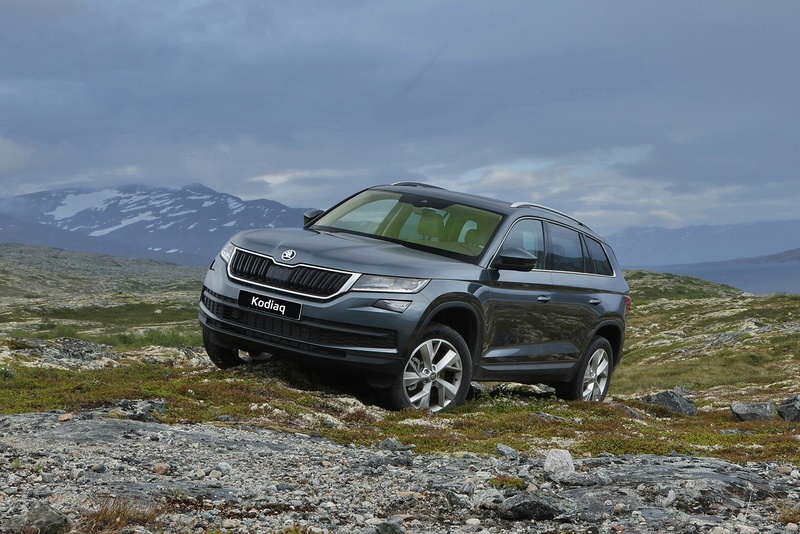 At Bristol Street Motors we don�t just have the best SKODA Kodiaq 2.0 TDI Sport Line 4x4 5dr DSG [7 Seat] Diesel Estate deals, we also offer friendly advice and help with all your enquiries to ensure your buying experience is a happy experience.